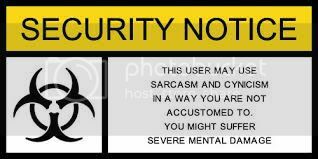 Luckily for me there are ways to deal with that system overload. One was, once again, brought to my attention, while out with the boys from work. Ohh how I have missed being out in the woods, strolling along the shores of a lake or just sitting there, watching the things that are going on around me. Part of that pleasure I find at home as well, but this is different. More tranquil, more to the core. I am seriously planning on picking up the hobby or more like lifestyle (again), that bushcrafting provides. Gardening only goes so far. There are some things of a much more elementary nature that need feeding as well. But it'll have to wait until autumn, when the working hours and gardening become less, the normal routines take over and the heat of summer dissipates. A weekend gathering during the final weekend of september is booked and I am taking my oldest daughter. At home it is working in the garden that revives me; being on my knees, close to the ground, hands on the plants, fingers stained with soil or just sitting next to one of the hives, watching the bees doing their thing. When I stand in their flightpath, they whizz by me, sounding like a propeller plane, closing in from behind and then buzzing by, the hum fading away a few meters in front of me. Or just sitting on our "new" garden hangout, under the pavilion, looking at the bugs and the birds, reading or just doing nothing... A 3 day mini vacation, forced upon me by the sudden arrival of real summer heat. I noticed an increase in bird numbers, chattering and calling around me and now the noisy gulls have gone back to the sea with their raised young, a deep silence has spread over the area, occasionally disturbed by manmade noises, but not at all that often. Even the summer guests this year are less noisy, it seems. I think my thoughts, think of all the things I "need" to do, of the plans I had made for this season. An old wisdom says that no plan survives first contact with the enemy or in this case every day reality...... Mesmerising, daydreaming, just letting the thoughts come and go and I follow the waves. It is during times like these that I get my ideas or suddenly stumble onto solutions for existing problems or issues........... and then I saw it! Them actually, as there were two of them.... A rare guest in our garden; a stenknäck! (or hawfinch Coccothraustes coccothraustes) Its size, colour and beak were unmistakable. We had been hearing a regularly repeating, snapping sound coming from one part of the tree, where a bird cherry stands and they caught my attention as they were squabbling, bending the branches and making noise. 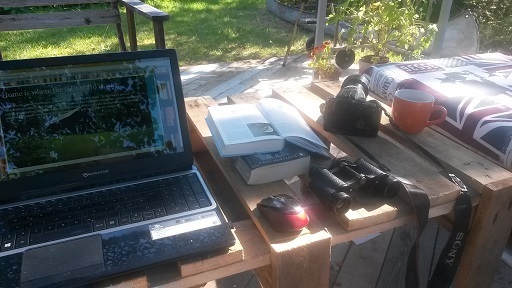 And so I mostly sat for the past few hot days; reading, drinking, planning, doing as little as possible, waiting for this spell of hot weather to pass. Which it eventually did of course. While at work, I work with refugee teenagers that came here on their own, I often look at the guys and wonder:"How the hell do they get through the day, each day, every day?" They have nothing to do, next to nowhere to go to, no family, little friends, very limited resources and loads and loads of time....... and a continuesly turning and grinding mind.... There's tv, there's the internet, but seriously... how much time can you spend in front of a screen in your room before going stark raving mad?? Last autumn I introduced scale modelling to them. Building plastic scale models, just to pass time and do something creative. It was a huge success. Of the anticipated 4-5 kids that I figured were interested, I ended up doing sessions several hours long, with up to 14 kids and I had to pry knife and glue from their hands late at night. So I figured I should try something like that again. Like that, as in "getting them away from a screen and do something". And since Sweden is comprised of woods for more than 50% these days (55% according to some sources) I figured I'd introduce them to the great outdoors, the greener side of Sweden. And there was a catch, well more than one actually.... For next to none of them had really seen the woods, other than from the sidelines; through the window of a vehicle or next to the road. 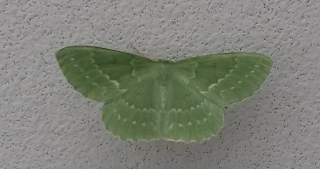 So a number of them were scared or at least very wary of that great, mystical world behind that green wall outside their bedroom window. Another catch was the total lack of proper equipment, meaning no decent shoes and clothes, let alone gear like backpacks or some such. This meant finding a way and a location for them to take it all in in a relaxed and comfortable manor. The location was being handed to us, by being able to use the local scouting groups facilities, the way I had to provide. I have been making plans and gathering information for these last few weeks now and I created a sort of handbook that we could use. Because there was another, sneaky catch; most of the info provided was written in adult Swedish, often too hard for the boys to understand. It had to be plain and simple Swedish. So that meant a lot of searching, rewriting and translating too. But in the end I came up with a great handbook. Great because they can read and understand it, it has all the essential ingredients and topics with explanatory images, it did not become a 10-volume encyclopedia and best of all; they thought it was great and above all useable. So did some of the staff, so I am quite proud of that achievement. Great in another aspect, since even I (re)learned a thing or two. A few days were planned ahead, where I would take those interested out and as those dates grew nearer I was getting more nervous. Had I thought of everything? Did I take all the necessary precautions and steps and how would I do, teaching and showing a group of teens/young men? After all this was an absolute first for me, too. I need not have worried. A small group showed up, just 4 of them, but they were motivated and looking forward to it. Some backed down, because they were uncomfortable with the idea and others because of pressing arrangements elsewhere, like summerjobs. And there were those who tagged along on just one of the days too. And we did well if I may say so. 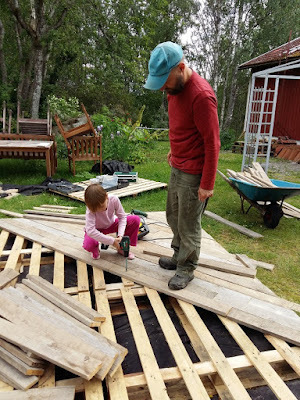 We talked about things like the Swedish allemans rätten (everyman's rights), flora and fauna, some first aid like insectbites or injuries, how a simple mishap can turn into a serious situation and what to do when that happens. We even had some geartalk, having me showing my things to them, telling them what I thought are basics and essentials. 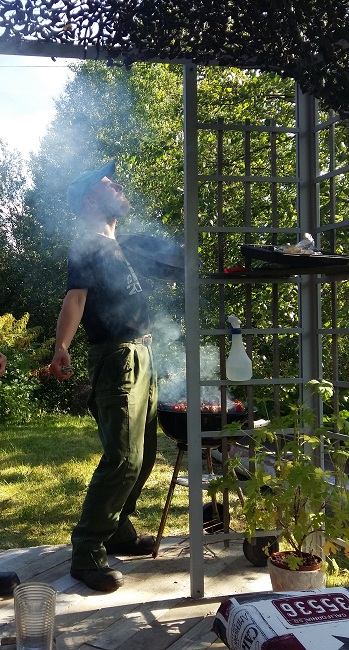 We did a 3-day "course", which included foraging (loads of blueberries being thick, ripe and juicy) and at the end of that we prepared food over an open fire. Not just a barbecue, but food including potatoes and vegetables. I was planning on doing a banana-dessert, but all those vanished, before we even got to the food cooking part. Which incidentally included how to build a fire, which means we have to make one and how to use them. All in all a very successful introduction, leaving everyone involved feeling very content. I am most certain that we will have a part 2 and hopefully many hikes. The ones who accompanied me were already asking me about camping, staying out for a night and things like that. I was able to show and teach them a good deal, they all kept and read their handbook and during the talks and discussions I learned a great deal about them too. It felt great to hear that they felt at ease out there, since it is a vastly different environment then what they are used to and I noticed they also "suffered" from that inevitable effect a forest has on most; they fell quiet and relaxed, being at peace for those hours we were out there. It was a total success in that I managed to take away their initial fear, wariness or anxiety, so that they could enjoy themselves.I opened up to them and they opened up to me, which meant we could pass information back and forth and listen to each other. Because we were a small group, we could focus on each other and the subjects at hand without distraction. But most important of all them could relax for a few hours and we simply had fun. Unfortunately privacy regulations prohibit me from showing the good times we had. I feel honored to have had them with me........ and I am very much looking forward to taking them out with me again. There is not much stand still here at Casa Chaos. Apart from the bee business we of course keep busy with other things too. It never really gets boring around here. For one I built a patio! OK, I had help.... We urgently needed a place to hang out in the garden. It can't be all work, no play. Keeping priorities straight 'n all that. I have been gathering quite a lot of materials here, most of them for free and/or discarded by others. 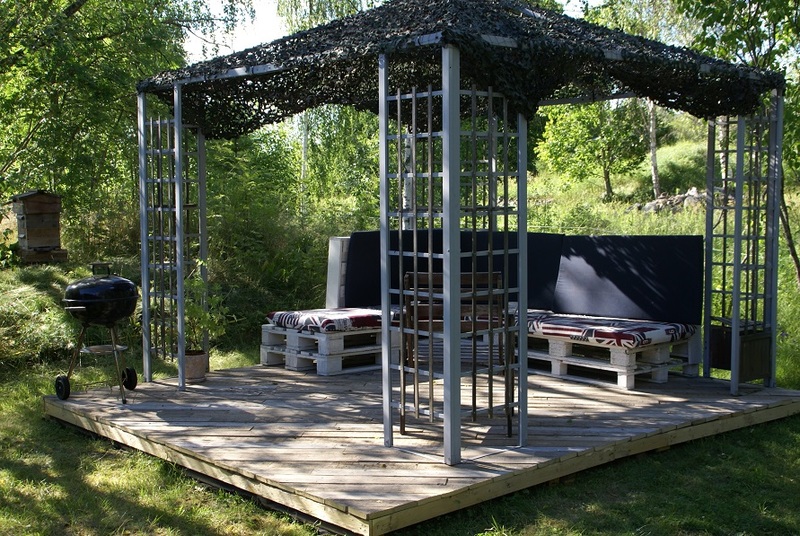 The frame is made up of transports pallets, which I collected from a store, selling outdoor stuff like swings, trampolines and such, run by a Dutch couple. 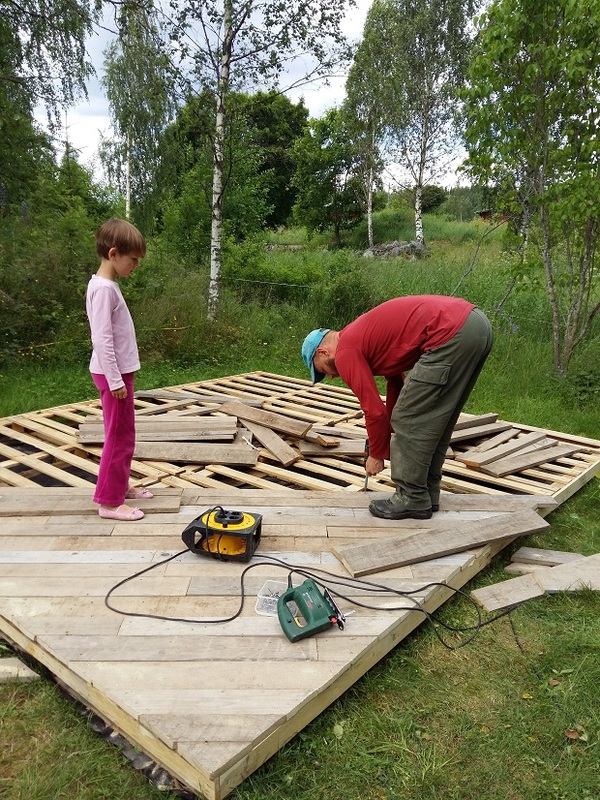 The deck is made out of the planks I saved, when I cut up a large amount of redundant potato crates. The pavilion I got real cheap, when someone wanted to get rid of it and the pallet bench with cushion has pretty much the same story. A day of screwing around (literally) and we had a nice place to sit and hang out. The camouflagenet has been lying around for years, since no one wanted to buy it of me. So why not use it? And that investment of time almost immediately paid off, because on the second day after this job was done, we could welcome a guest from the Netherlands. An old colleague from our police time, whom we had not seen for more than 16 years. It was nice to chat about things and people from a shared past. Made me realise how lucky we have become with this place we call home now, how we have grown as people (mostly old...-ish...) and how perspectives and preferences have shifted and changed. 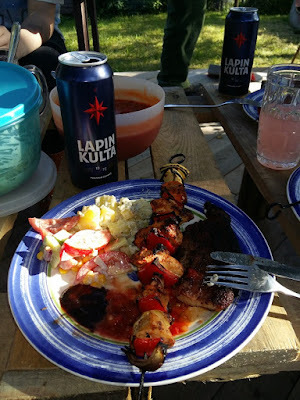 And since the weather remained fair that week we also tested the patio under barbecuing circumstances. It held! But we do have an ant infestation and despite trying every trick we knew of, we could not get rid of them. I hate to admit it, but we used non environmentally-friendly means... After being bitten and sprayed upon with acid regularly it quickly stops being a mere nuisance. But why stop at that? After the B(eehives) comes C(hickencoop) and a D for dogproofing the backyard. That means building a coop and fencing in a substantial part of our little patch of earth. The floor of the chickencoop is ready. Again using pallets as a base on top of stones at the corners and central resting points. I closed up the floor by screwing salvaged planks from other pallets in order to be able to insulate it later on. The summer so far has been reasonably sunny, dry, windy but not really warm. Not much of swimming weather. However the lakes are at a low. There's all 20-30cm broad yellow band around the shores, where the reeds usually would have been submerged. The streams around here are shallow too and we constantly go from normal forestfire risklevels to high and back again. That's when the rain, mostly as days with showers, have passed. Then the sun comes out, the wind picks up and within a few days the levels go up again. We had a grassfire due to lightning strike nearby, but that was dealt with when the rain came pouring down. Our garden is thriving too. Well, at least we think we are doing quite well this first serious gardening year. The potatoes are growing well and blooming prolifically (quite surprised by the beauty of its flowers in mauve and white), the kale and cabbages are not being devoured by pests (yet) and the combination planting seems to work as we are generally not experiencing any pest problems. The only plants lagging behind are the beans, peas, leeks and salad. Those 2 plantbeds are not doing well in general. The soil is very compact, heavy and rock hard when dry, so we really need to add loads of compost to those, just to loosen things up. The tomatoes and peppers in the greenhouse are not growing really well either, but we suspect that that is more our doing. We need to water those much more. I have underestimated the warmth AND the evaporation in the greenhouse. The latter is being caused by leaving the doors open during the day, so bees can go in and pollinate, but it also means a lot of air movement. As for the greenhouse itself, I am not impressed by it. The overall use seems quite alright, but the quality of the material, especially the foil, seems inferior. It had a roomy fit over the frame from the beginning, but the warmth of the sun and the weight of the rain has stretched it even more and now it is just saggy. It covers the frame loosely, bellowing outward when it is windy and sagging dangerously under the weight of collected rainwater after a severe shower. Upon inspection it turned out the seams attaching the velcro to the foil had started to tear as well. Not impressed at all here!! Investing in that grass- and weedtrimmer was a good thing. We can now say we have the garden "under control", meaning we can pretty much keep up with the weeding and cutting of both the vegetable garden and the "lounge area". And then.... circumstances forced us to do a drastic thing. 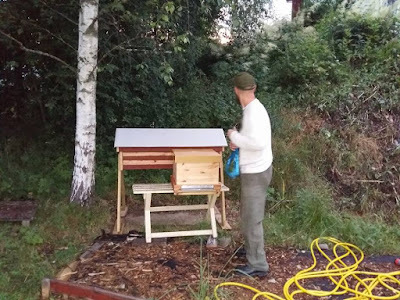 We decided that we needed to move one of the top bar hives with its population to our place, because the location it was in is likely to be inaccessible to us in the nearby future. 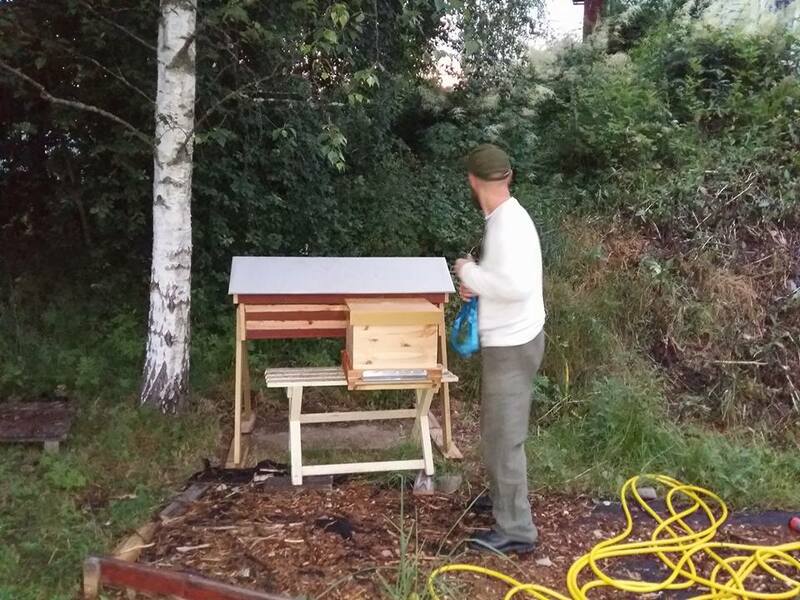 Given the size of the hive and its delicate contents it was a challenge and after a very long and very slow 30 minute drive we came home, put the hive in its new place and had no problems during the entire transfer or immediately after. 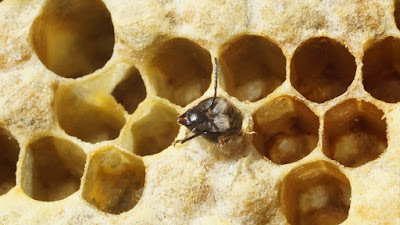 How the bees will fare in the near future we will have to wait and see. I'll get back to this transfer in more detail at a later date, but soon. As said today was the second day of operation "Bee home". We were going to move the bees at our place. Now there were some differences when compared to the operation yesterday. For one the bees were lighter and seemed smaller. 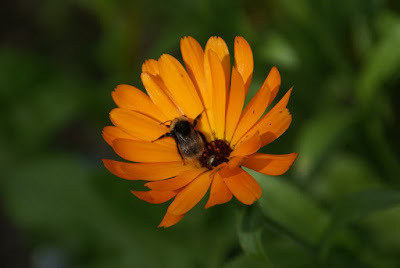 Another one was that the bees turned out not to be as friendly as their dark hued cousins yesterday. Not overly aggressive, but quite a bit more defensive. 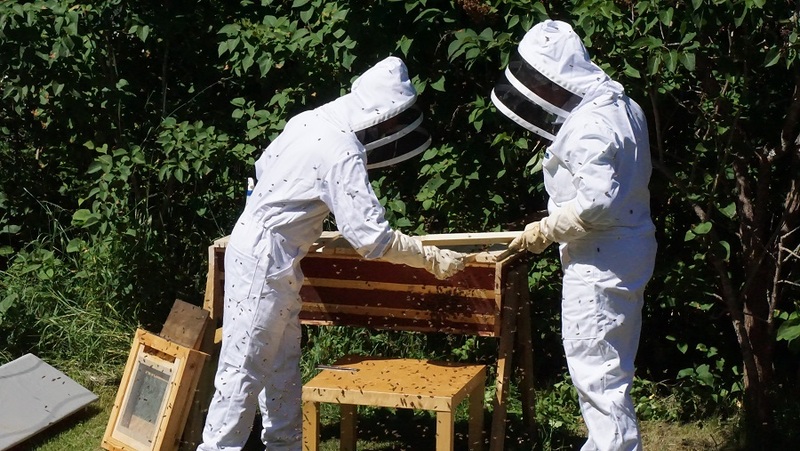 Yet still easily within the limits of the acceptable and once we had done our thing at the hive, they very quickly calmed down and went back to business. A third difference was their numbers. This hive had much less occupants than the one before. In total maybe up to 60%, but that is a rough estimate. 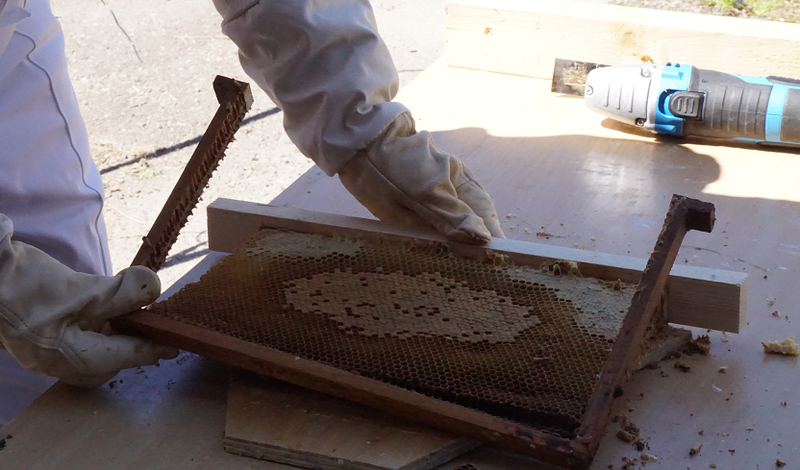 Three of the frames were unused and on one of these the bees had only just begun to build cells. 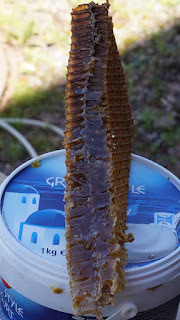 On the other combs there was not all that much brood or pollen, but quite a bit of honey. 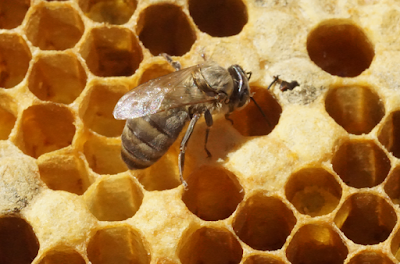 We also noticed that the bees had built 2 very large cells, which had hatched. A new queen?? There were also more places where the bees had gone wild building; large extensions on the combs, both in depth and around the frames. They had had too much room apparently. Needless to say that today's operation went faster, both due to less work and knowing what and how to do it. We decided to feed this population the recommended 1:1 ratio sugar water just to give them a boost. Our hive now houses 7 top bars + 2 empty ones. I will keep a close look on their development, hoping they will bring in more pollen. We had a good scare as well. 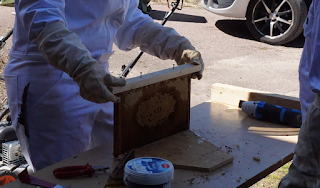 When we were more than halfway through the frames we discovered a large dead bee at the bottom of the box... Oh dear, not the queen?? However on the next frame my wife, once again, spotted a very large bee and the dead bee turned out to be a drone, judging by the relatively short abdomen and the large eyes.... Other then that we pretty much followed the same routine as before. This time our oldest daughter had the camera, yet she didn't dare come near. We once again saw bees hatching and the wax in this population was much darker and tougher. So we are keeping our fingers crossed. Yesterday's box was filled to the brim. Today was a great day.... a grand one. really. 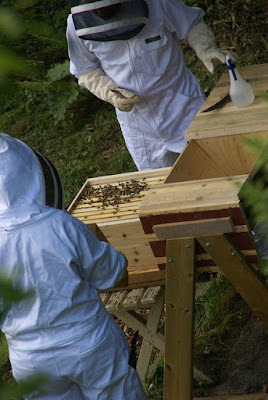 Today would see us, my wife and me, moving the bees from the first box with frames into a top bar hive. A very first for me, but a very first regarding handling bees in general for my wife! And we did well!! 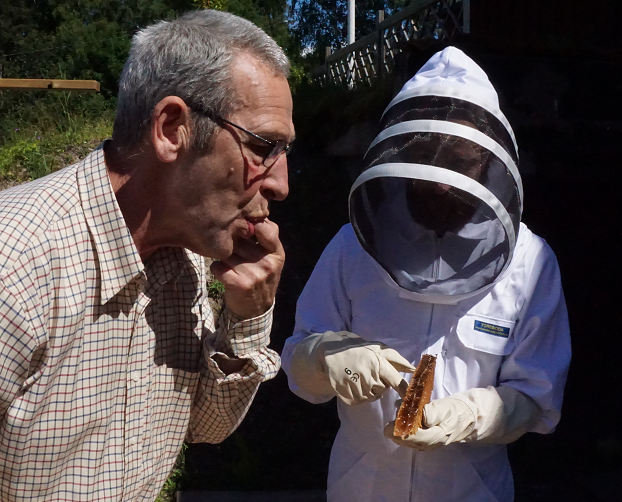 The bees turned out to be very gentle, not a single act of aggression towards us, despite us handling them, disturbing them, upsetting them and moving them. It, after all, is quite a large operation with a lot of direct handling and a lot of impact on them. It started by placing the boxes, containing the bees and their framed cells as close as possible to the entrance of the top bar hive (tbh), so that they could get used to the flight direction and location of the entrance. Quite important, since they memorise that location and focus on it. We placed the box there last friday late at night and left them alone over the weekend. They got going early saturday morning, bringing home mostly pollen. 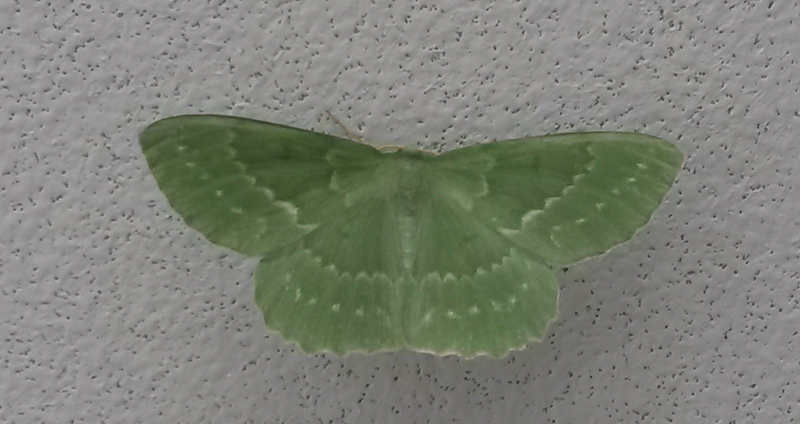 A good sign, since that means they have young to raise, which means there is a queen laying as well. Today the first thing we did, was look at Johans clip again (see the previous post) and we prepared. We put all the necessary tools ready at hand; goosefeathers (no brushes since these are too coarse! ), a spray bottle with water (no smoke! ), hive tools and a small saw to cut the frames. Then we put on the suits and keeping the citronella-tip in mind (which says using citronella essential oil will make the new home more attractive to the bees), we used a fresh leaf directly from such a plant. 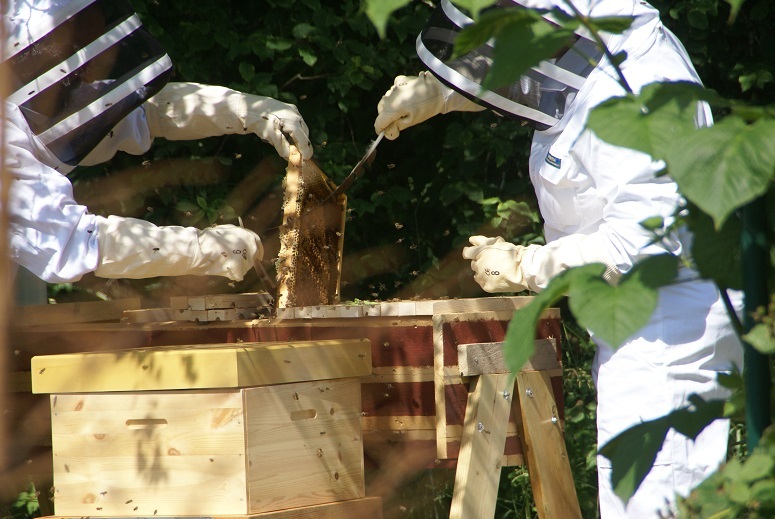 I rubbed the inside of the hive and follower boards gently with the leaf. With a bit of a pounding heart (mine at least) we approached the box and we positioned ourselves at either end of the box and tbh. We clearly decided who would do what in advance. 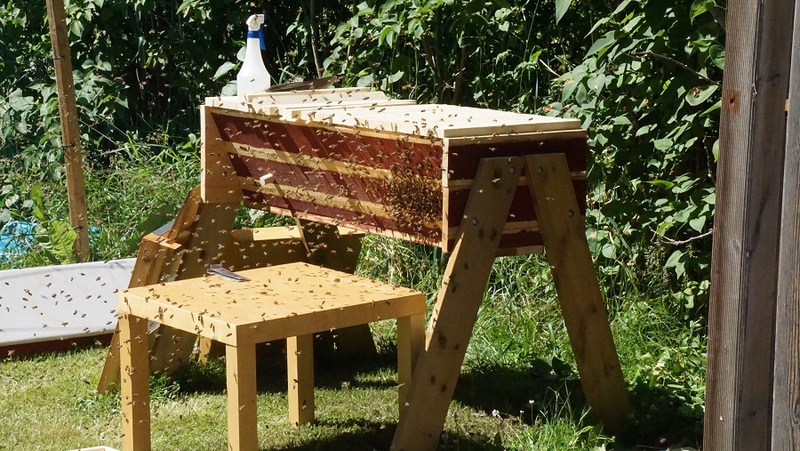 My wife would lift the top, I would take out a frame, we would brush back the bees into the box, she would close up and we would prepare the frame and the top bar in the shade, a few meters to the side) The first 2 frames/bars would be dealt with this way, so the bees would have something to go home to, once we would start moving them over. Things went rather smooth from the beginning really. The first 2 frames were pretty much empty, apart from some cells being filled with mostly pollen and a few cells with larvae. 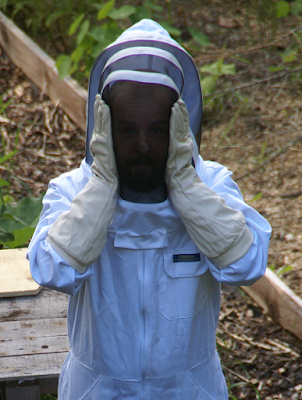 Despite bees flying all over the place, there were no signs of aggression at all. 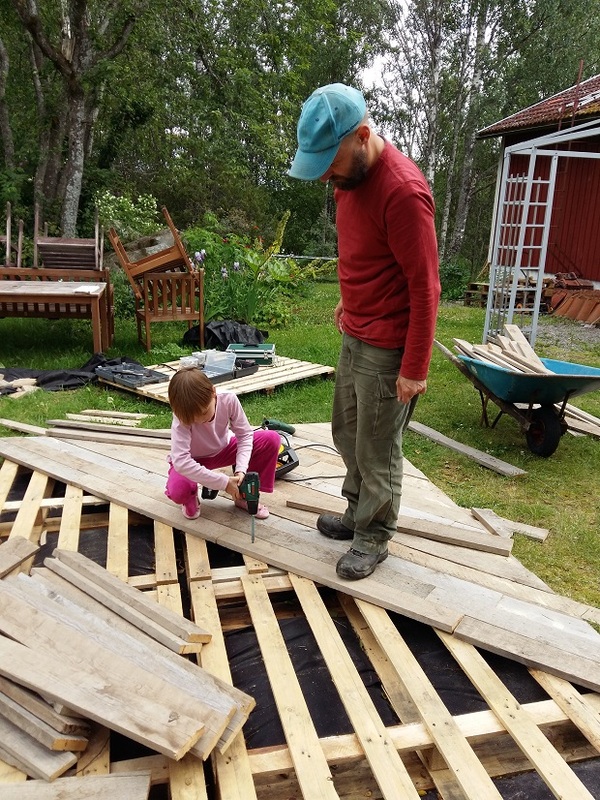 We both felt at ease, yet focussed all the time and we pretty much copied Johans way of doing things. After this things got real interesting! 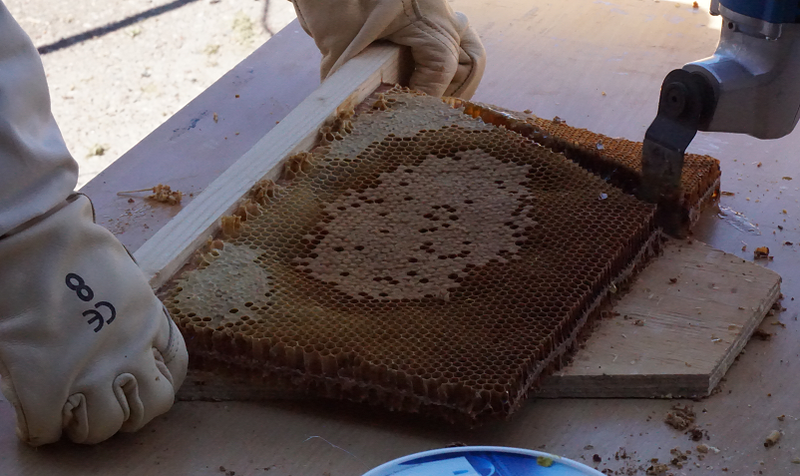 The rest of the frames was packed with bees, lots of capped brood and honey, quite a lot of pollen and uncapped honey too. Even some uncapped brood. We lifted a frame, held it over the tbh, keeping an eye on it, taking care none of the bees fell off. 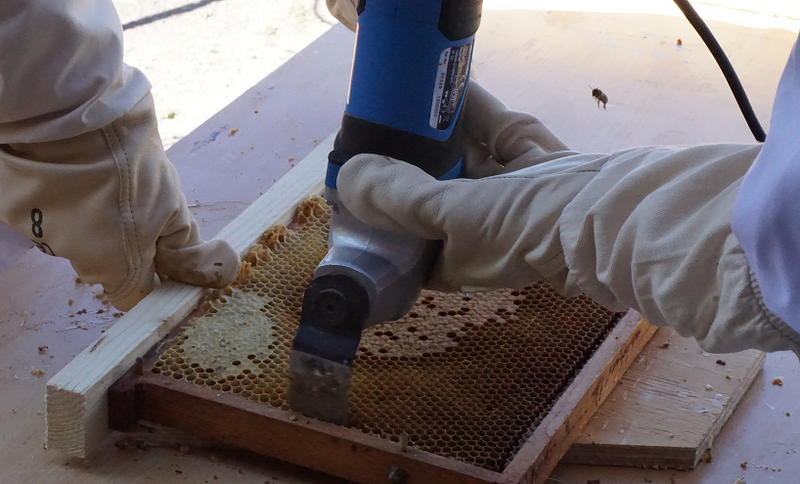 We brushed the hive bees off and the flying ones would find their own way to the new hive. And then, with frame 5, surprise nr.2; my wife spotted the queen!! She was quite striking; large and very dark. We moved her over to the tbh, gently brushed her off and now we knew for certain where she was. It becomes easier with every frame, yet the whole operation took us somewhere between an hour and a half and 2 hours, including dressing up and preparing. 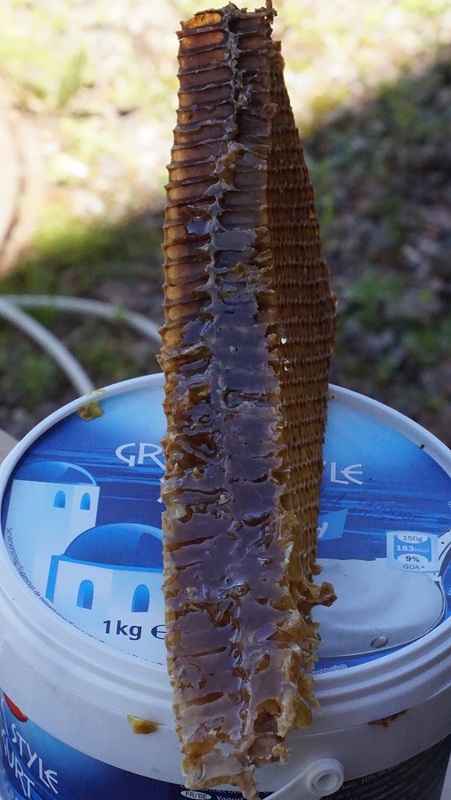 No stings, no mishaps, breaking combs, but another bonus.... Honey fresh from the comb!! It had a nice, rich, intense, slightly "dark" taste... Fit for a king!! I must say that I am quite astonished of us and proud of wife! 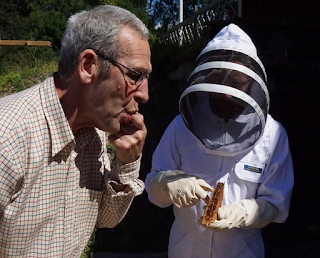 I did have a course in conventional beekeeping, 2 years ago, so had been near bees before. But it was no where as near as this! Johans video was a huge help for sure, but also the worth of buying and studying books has proven itself once more. And then my wife; no sign of fear or hesitation. She remained calm and respectful, even during the last stages, which became quite lively!! Finally.... our bees have arrived! Our very first bees; one box at our place, one box at my parents in laws place. I placed the box as close as possible to the opening of the topbarhive, so the bees will have orientated themselves before the move. This was last night, just before 22:30... Yes, pm!! We will move them into the topbarhive next monday, when the weather will have improved and many of them will be out... hopefully. And wouldn't you know it; as we were driving towards the place we were to collect our bees, I got a call from someone in our village. If I still was interested in bees? The old beekeeper here has a lot of his old stuff still stored in a large open shed and a swarm of bees had nested themselves there... So I'll be going there this week and will check it out.